Let us help you first determine whether the problem is serious enough to require attention. And if attention is needed, we feature state of the art leak detection equipment to make your leak detection process as painless as possible. All pools will lose water through evaporation and splash-out, at slightly different rates throughout the year. Water loss will always be greater when there is a significant difference in the air and water temperature, when its windy, or if your pool has large waterfalls or spillways. Typically, water loss through evaporation and splash-out should not exceed ¼” in a 24hr. period. You can perform the two simple 24hr. tests, that follow, to determine whether your water loss is normal, or whether you may have a leak in the pool shell or plumbing. And remember, before you perform these tests, make sure you have repaired any leaks that are visible at your equipment pad. Important Note: Do not perform this test if there is a danger of freezing temperatures. Turn your pool equipment off. Ensure that timeclocks or computer systems have been overridden so that equipment won’t come on during the test. 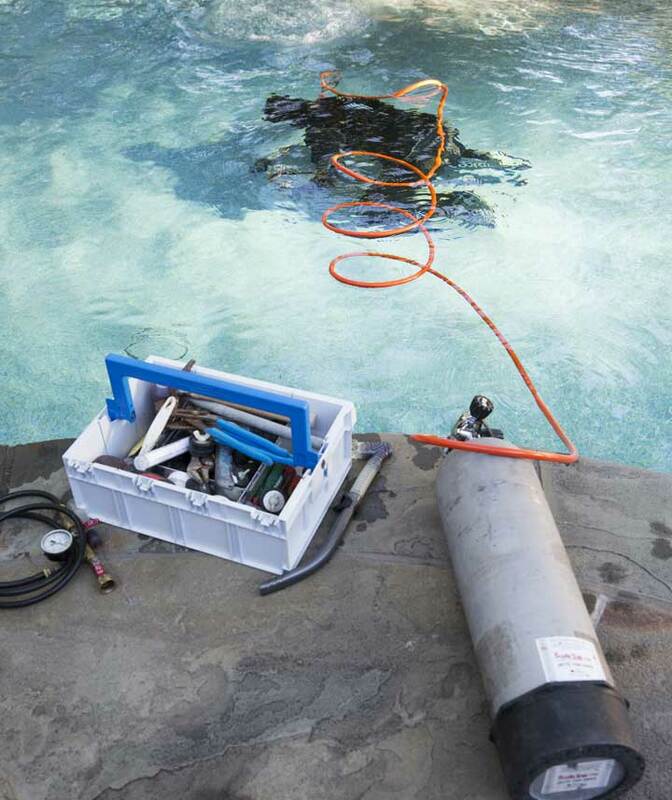 Use a grease pencil, or tape, to mark the current water level in the pool. Allow the pool to sit for 24hrs. At the end of the 24hr. period, note difference in the current water level and the level you marked in step 2. Results: Water loss greater than ¼” may require a dye test, to identify where the water loss is occurring. Common leak locations are at the pool skimmers, return lines, light fixtures, drains, and in some cases cracks in the pool. Important Note: The Pool must be carefully monitored during the pool plumbing test. Do not allow the water level to drop below the skimmer. If the water level drops below the skimmer, damage to your equipment may result. If the water level drops rapidly, stop the test, record the amount of water loss and the length of time the equipment ran. Set your pool equipment for a continuous 24hr. operation. Allow the pool to run continuously for 24hrs. At the end of the 24hr. period, note the difference in the current water level and the level you marked in step 2. Results: Typically plumbing leaks will result in significant water loss during this test. Water loss greater than ¼” usually will require a pressure test and leak location. Use this simple bucket test to determine how much of your water loss is due to evaporation. Scoop up a bucket of pool water, and place it in the pool on a top step or swimout. Mark the water level in the bucket. Compare the amount of water loss during the same time period as the tests above. Any water lost in the bucket will be caused by evaporation. And if the pool is not leaking, it should also be very close in loss to the water in both tests above.